We’d love your help. Let us know what’s wrong with this preview of Flash Back by Ellison Blackburn. The inevitable breakthrough. An irresistible opportunity. The second chance of a lifetime. Generation Xer, Charlotte Fenn wishes she had made different choices. Perhaps if she had her life would not seem to be flatlining toward more of the same—the mere thought is depressing. However, just as change is certain, life itself is unpredictable. And so, in her wildest imaginings The inevitable breakthrough. An irresistible opportunity. The second chance of a lifetime. Generation Xer, Charlotte Fenn wishes she had made different choices. Perhaps if she had her life would not seem to be flatlining toward more of the same—the mere thought is depressing. However, just as change is certain, life itself is unpredictable. And so, in her wildest imaginings, Charley could not have guessed that hope would arrive via a medical breakthrough. To ask other readers questions about Flash Back, please sign up. I am a huge fan of diversity within established genres, especially sci-fi. Regeneration X is a subtle yet welcome deviation from the realm of space ships, robots, and laser guns. Set in the very near future, I do admit to raising an eyebrow at some of the author's predictions. I can accept that in ten years we might have the technology to regenerate ourselves on a cellular level and cybernetic implants are already in use as treatment for medical conditions,but I am not quite convinced that we as I am a huge fan of diversity within established genres, especially sci-fi. Regeneration X is a subtle yet welcome deviation from the realm of space ships, robots, and laser guns. Set in the very near future, I do admit to raising an eyebrow at some of the author's predictions. I can accept that in ten years we might have the technology to regenerate ourselves on a cellular level and cybernetic implants are already in use as treatment for medical conditions,but I am not quite convinced that we as a nation will end poverty within the next century, let alone the next decade. Charley was a fascinating character. On many levels, I related to her thoughts and concerns about growing complacent with life as middle age sets in and I've often had the same worries about making memories vs simply existing. I have to wonder which path I would choose if the option of regeneration was open to me. Honestly, I'd likely go for the cybernetics, and I think that's what I loved most about this story: it made me think. When it comes to books, I’m caught by two things: prose style and intelligent, complex, believable and somewhat quirky characters. Quotes by Shakespeare in the chapter heads is a big plus, too. “Regeneration X” offers all three. The author has put a great deal of thought into her characters and setting, honing the details to perfection. Better yet (in my opinion), she writes with the incisiveness of a clinician deeply informed by the sensibilities of a poet. This is rare and personally, I would When it comes to books, I’m caught by two things: prose style and intelligent, complex, believable and somewhat quirky characters. Quotes by Shakespeare in the chapter heads is a big plus, too. “Regeneration X” offers all three. The author has put a great deal of thought into her characters and setting, honing the details to perfection. Better yet (in my opinion), she writes with the incisiveness of a clinician deeply informed by the sensibilities of a poet. This is rare and personally, I would place “Regeneration X” among the top ranks of the literature with which I am acquainted. I have a dislike of attaching numbers to art. Numbers are very fine things, but the prevalent mania for ranking stuff leads to them slopping over into areas they were never meant to go. One does not understand art “by the numbers” and art is what we have here. So (on reflection), I have rated this 5 stars, up from my original 4, because my original rating attempted (poorly) to express a multiplicity of factors in which personal predilection played an uncertain role: a wish that just a little more heat would have been applied warring with the knowledge that doing so would weaken (and if overdone to the slightest degree, break) the entire work. In the end, I set aside my feelings and took this story as I feel the author intended, undistracted by my desire to meddle. Hence 5 stars. Some years ago, I encountered a man who believed in miracles. He was fervent on the subject and he expected these miracles to arrive “in clouds of Glory.” He said so several times. Aside from the fact that he made miracles sound like they were produced by ILM (I think he could’ve quoted Shakespeare to better effect), I felt he was destined to disappointment. I felt this way because I also believe in miracles and there was one, lying right there at his feet: a butterfly’s wing. (A red admiral, as I recall.) Seen at extreme magnification, a butterfly’s wing is a thing of remarkable beauty, but this (to me) is the miraculous part: the tiny structures that make it so also allow the red admiral to fly. But the man had his heart set on miracles being delivered to him by “clouds of Glory,” not the wings of butterflies. And so he left, no doubt hopeful but unfulfilled. I suspect he remains so. “Regeneration X” is like the wing of that red admiral. First, you have to notice it. Then, you have to pick it up (fortunately it’s not as fragile), and then you have examine it very closely. Finally, you have to think about it, undistracted by cravings for a quick and slippery gratification. Only then, will its beauty and power become accessible. That is the quiet challenge “Regeneration X” lays at our feet. We can pause in our daily rush to “somewhere” and take it up, or we can go on looking to be dazzled by clouds of glory. An insightful novel about the lonely darkness that nostalgia can bring upon us. In our longing to know where things went wrong, we often hide our self-doubt and failures with rose colored glasses. And sometimes what we consider to be a failure wasn't a failure at all, it simply did not meet our contrived and specifically rigid definition of success. When we narrow our vision of what we are, what we should be, what we can be, and what we could h Be careful what you wish for. You might just get it. An insightful novel about the lonely darkness that nostalgia can bring upon us. In our longing to know where things went wrong, we often hide our self-doubt and failures with rose colored glasses. And sometimes what we consider to be a failure wasn't a failure at all, it simply did not meet our contrived and specifically rigid definition of success. When we narrow our vision of what we are, what we should be, what we can be, and what we could have been, we often trap ourselves in a cage that can be nearly unbreakable. And when drastic measures are taken to shatter the bars, we often find ourselves in a lonelier, stranger place than before, where we realize that we weren't trapped at all. 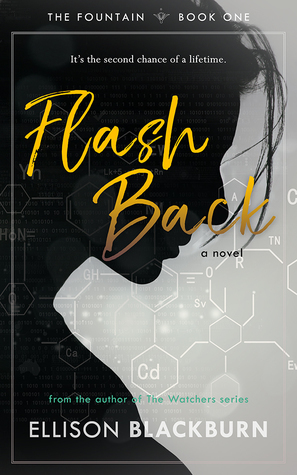 In Flash Back, by Ellison Blackburn, we meet Charlotte Rhys Fenn, a successful editor and writer for a health magazine. Charley is in her fifties, has been married for nearly twenty years, has plenty of income - and is bored out of her mind by her life. Held in a relationship that has long since become more of a habit than a marriage for both partners, with a repetitive job, Charley makes periodic tries to strike some chord of interest in her partner, and to find some way to alleviate the humdru In Flash Back, by Ellison Blackburn, we meet Charlotte Rhys Fenn, a successful editor and writer for a health magazine. Charley is in her fifties, has been married for nearly twenty years, has plenty of income - and is bored out of her mind by her life. Held in a relationship that has long since become more of a habit than a marriage for both partners, with a repetitive job, Charley makes periodic tries to strike some chord of interest in her partner, and to find some way to alleviate the humdrum of daily life. In desperation, she finally begins to research a cutting-edge surgery, known only as Renovation. This story is so unlike the novels that I usually read. I automatically signed up to review this before even reading the synopsis because the cover is so interesting and attractive. Sometimes, you just can’t help but prejudge a book by it’s cover! Regeneration X begins with Charlotte Rhys, Charley for short. She is in her fifties and a little regretful of the life that she has led thus far. She is in a marriage which is no longer romantic and fulfilling. With the technology as advanced as it cur This story is so unlike the novels that I usually read. I automatically signed up to review this before even reading the synopsis because the cover is so interesting and attractive. Sometimes, you just can’t help but prejudge a book by it’s cover! Regeneration X begins with Charlotte Rhys, Charley for short. She is in her fifties and a little regretful of the life that she has led thus far. She is in a marriage which is no longer romantic and fulfilling. With the technology as advanced as it currently is in 2024, Charley feels like this is her opportunity to begin again. She researched the new process of Cell Regeneration which will rearrange her current cell pattern, allowing her to regress back to an earlier age. With her doctor’s assistance, she takes the leap. The consequences of her actions seemed to minimal until after the process has been completed. When she regresses to a 17-year-old version of herself, she realizes that this procedure will change the way the world sees her…including her husband. Since this is a once in a lifetime procedure, will Charley regret her decisions later? My favorite character in this story is Charley. Her personality is a little ill-perceived at first due to the way she feels. When she starts visiting a psychologist, thinking that depression may have bottomed her out, she finds out that she still has the opportunity to make her own decisions. A light sparks and Charley is no longer the same as before she stepped into Dr. Baum’s office. I really enjoy reading about her self-doubts and the plans that she makes for herself, all for happiness. These situations and issues the Charley must face are real and I am able to relate to some of them. One thing that I appreciate about writers is when they demonstrate a true command of the language of their story. I enjoyed the descriptive nature of this author's tale, and the way she used such a large vocabulary to describe the thoughts and actions of her characters. I had some trouble getting into the actual story itself, though. It seemed like it took a long time to get down to the meat of the book itself. Told from the perspective of Charley, a 54 year old married woman who had fallen into One thing that I appreciate about writers is when they demonstrate a true command of the language of their story. I enjoyed the descriptive nature of this author's tale, and the way she used such a large vocabulary to describe the thoughts and actions of her characters. I had some trouble getting into the actual story itself, though. It seemed like it took a long time to get down to the meat of the book itself. Told from the perspective of Charley, a 54 year old married woman who had fallen into a life of settling for what had become comfortable over the years, "Regeneration X" is relayed through the thoughts and diary entries of someone who wants more from life but feels that she no longer has control to choose what she feels is best for her. When she begins seeking out therapy, she learns in her sessions that her lack of control is just an illusion she has created and so she starts to assert herself and make major life-changing decisions that could potentially either strengthen or destroy her marriage. She decides to undergo a procedure called regeneration. From that point on, her life changes dramatically. This book was really intriguing. It was a unique idea and really made you think about what you have in life and what you want in life. If you had a chance to go back and change your past to effect your future - would you? Ellison Blackburn has woven an imaginative, though provoking story. Imagining what could be and asking questions of what the world is becoming and what technology is leading to, along with personal questions of where we are in our life, where our pasts have lead us, and what wou This book was really intriguing. It was a unique idea and really made you think about what you have in life and what you want in life. If you had a chance to go back and change your past to effect your future - would you? This novel really got me thinking....would I do it? Honestly I wouldn't go back to under 21 at least....I gotta have my wine. But the premise it puts forth is one so many people wonder on a daily basis, if I could go back and start again what would I do, what would I do differently? Ellison puts together a really interesting novel that gives you insight in how this would change a person's life. I enjoyed reading and would recommend to any lovers of insightful stories. In Flashback, by Ellison Blackburn, we meet Charley, a middle-aged married woman who undergoes cellular regeneration. Cellular regeneration gives Charley the body of an eighteen year old (even though it doesn’t increase her overall life expectancy) without any loss of her memories or previous life experiences. What seems at the outset like a uniformly positive change without qualification, leads to many unexpected difficulties. It is a coming-of-age story with the twist that Charley is coming-of In Flashback, by Ellison Blackburn, we meet Charley, a middle-aged married woman who undergoes cellular regeneration. Cellular regeneration gives Charley the body of an eighteen year old (even though it doesn’t increase her overall life expectancy) without any loss of her memories or previous life experiences. What seems at the outset like a uniformly positive change without qualification, leads to many unexpected difficulties. It is a coming-of-age story with the twist that Charley is coming-of-age a second time. This Shakespearean quote aptly describe's Ellison Blackburn's Regeneration X. Some time in 2024, man has discovered how to stop cell degeneration, reverse aging up to a certain point and physically take your body back in time through gene splicing and cell regeneration. Could undergoing Renovation, the above process, be the proverbial golden fleece for longevity? In the chronicled life of Charley, Blackburn makes a real attempt to address the real problems people face if Regeneration/Renovation was even remotely possible. Every good thing comes with a sacrifice. Charley, at 52 years old, finds herself depressed and unhappy. She finds herself in a circular day in/ day out existence and she begins asking herself the question of "Is this It?" She also finds herself looking at her husband and marriage and comes to a disheartening conclusion that even though she loves her husband and he her, they are living a life of coexistence. Through the help of a psychiatrist, Charley decides that she will go through the process of Renovation as a means to give herself the chance to make different choices that would lead her to a different existence. Even though Charley goes through all the processes to make sure that she was doing the procedure for the right reason. Charley does not foresee trouble in certain fundamental aspects of her life namely: Michael and how she would be viewed by society/how society would view her. Charley comes face to face with the ramifications of the procedure and finds that life as she knew it would never be the same. She would become someone else and so would he. While Blackburn makes an avid attempt of a true science fiction masterpiece, her story does not fulfill its true potential. Not in the fact that the scientific aspect wasn't down, it was in the deliverance of the story. While Blackburn does put in the prologue that the story you are about to read was a chronicled life of a Regeneration Xer, Blackburn lost me with the journal within a journal format, flashbacks, and dream within a dream. At some points of the book, I found I had to read the section twice/thrice to have a full understanding of what was going on and who was talking. Secondly, there were certain topics in the book, I thought did not lend anything to the main idea of Regeneration. While some of Charley's self analysis was relatable, I could not say that most people would even have any of the thoughts she had. Thus, some of the relatabilty I once had in the beginning chapters died as I got further into the story. All this said, Ms. Blackburn does have tremendous writing potential and this book I would say is the stepping stone of a brilliant science fiction story. I would read her work again. Regeneration X is a story set in the near future about regeneration (specifically called re-aging). The main character finds in the middle of her life that she is unsatisfied. Due to her unhappiness, which she wrongly self diagnoses as depression/mental health issues, she seeks professional support. Unsatisfied in her marriage, career, and uneventful life she decides to seek out a solution. After journalist and meeting with the therapist for an extended period of time she decides to explore the Regeneration X is a story set in the near future about regeneration (specifically called re-aging). The main character finds in the middle of her life that she is unsatisfied. Due to her unhappiness, which she wrongly self diagnoses as depression/mental health issues, she seeks professional support. Unsatisfied in her marriage, career, and uneventful life she decides to seek out a solution. After journalist and meeting with the therapist for an extended period of time she decides to explore the idea of re-aging. Upon more consideration she re-ages to the age of 17. This provides her with a fresh start in life to do the things she truly finds enjoyable. Breaking away from her redundant life she starts college in a different country. This allows her the freedom to explore life openly, finding the happiness she was missing before. The path is not clear cut. Many complications can stem from re-aging. This journey of discovery, love, loss, finding happiness, and rebirth is never ending. The idea of re-aging is enough to get me thinking. In the era we live in this could be a true possibility. What if we could do life over? If you could do everything over again keeping the wisdom you have now would you? This is a novel about the choices a person makes in their life and dealing with the consequences of those choices. I’ve never read a book like this and I was really fascinated by it. It is set in the not too distant future where it’s possible for a person to be ‘regenerated’, having your very cells de-aged to any age you choose. I really liked the main character Charlotte ‘Charley’ as she tries to make sense of what she wants. She thinks she’s depressed but that’s not the case, she’s just convinc This is a novel about the choices a person makes in their life and dealing with the consequences of those choices. I’ve never read a book like this and I was really fascinated by it. It is set in the not too distant future where it’s possible for a person to be ‘regenerated’, having your very cells de-aged to any age you choose. I really liked the main character Charlotte ‘Charley’ as she tries to make sense of what she wants. She thinks she’s depressed but that’s not the case, she’s just convinced herself she could be. Her misgivings and struggles are so real. The description of the technology of 2026 was interesting and detailed in-depth. A thought provoking read for anyone! Interesting read. Very intriguing as to what very well could be possible in the not-so-distant future! Ms. Blackburn writes in such a way with great detail making regeneration very believable! This was a quick read & I look forward to seeing what happens in the next book. An ARC of this ebook was given in exchange for an honest review and as part of a blog tour. Opinions in this review are my own.